Of the winter activities in Big Bear Lake, skiing is certainly one of the most popular. With its own ski resort that boasts twin mountains, each with their own benefits and challenges, skiing in Big Bear is a heart-pumping sport with appeal for everyone. To ensure your day on the slopes goes as smoothly as skis on freshly groomed snow, see our suggestions below on how to prepare for this activity. If you’re looking for where to go for après ski fun, download our free Vacation Guide! It’s filled with suggestions for excellent local restaurants, breweries, and more! Skiing in Big Bear Lake can be a thrilling adrenaline rush, but it can turn sour if you’re not adequately prepared. Here are some things to consider when planning a ski trip to Big Bear. Make sure to pack plenty of warm clothes that you can layer. The base or wicking layer is the first layer you should don, and its primary purposes are to keep you dry and warm. It’s best to avoid materials made of cotton for this layer, as cotton tends to get wet and stay wet. For the middle layer, you’ll want to wear clothing that will keep you warm (fleece or wool is usually a good option). Finally, you’ll need an outer layer that is waterproof and can resist all the snow you’ll be around. Many external items you can rent from ski resorts and shops, like snowsuits, boots, helmets, and skis. This is a good option if you’re just starting out skiing. Lift tickets are ideal for those who are only planning to spend at most a few days at a given ski resort. Many resorts give discounts on lift tickets that are purchased in advance. Typically you can choose from partial-day, full-day, and multi-day options, and if the resort offers night hours, night tickets. Ski passes are a good investment if you plan to visit more than one ski resort during the ski season. The main options are the Epic Pass, Ikon Pass, Mountain Collective Pass, and Powder Alliance Pass. These give you access to several top ski destinations, but each varies in price and limitations, so be sure to do your research before purchasing. Ski season in Big Bear Lake is projected to open in mid-December and run through April. These are usually the months when Big Bear sees the most snow. Don’t fret if there isn’t snow, though; the ski resorts in Big Bear have snowmaking capabilities that make for reliable snow conditions. For a snow and weather report, visit Big Bear Mountain Resort’s page. Nothing complements a ski trip quite like a stay in a beautiful mountain cabin. Our cabins are all close to the main areas in Big Bear, including the lake, ski slopes, and the Village. Many are just a few miles away from all three. Choose from multistory cabins that can accommodate large groups or cozy retreats nestled amongst the trees. Many of our cabins include luxury amenities like fully-equipped kitchens and hot tubs with spectacular views. The Tree Spot is a fantastic skier’s retreat. This spacious 3-bedroom, 3-bathroom home features high-end finishes like hardwood floors, vaulted ceilings, and granite countertops. Curl up with a cup of steaming hot chocolate in front of one of the blazing fireplaces after a day in the snow, or soak in the hot tub while you look up at the clear night sky. This cabin is also pet-friendly, so you can bring your furry friend on vacation, too! 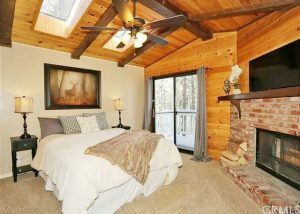 Be sure to browse all our luxury cabins before you book your stay in Big Bear Lake!